Featuring unique patent-pending bridge and adhesive system designs. Its the one professionals use! It s simple to use, just three easy steps and Pops-A-Dent removes dents from hail, car doors, and more, without damaging the surface of your car. 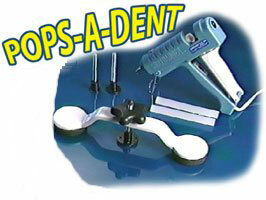 Pops-A-Dent saves you money and is the economical alternative to costly dent professionals. Develop and utilized by professionals auto-body experts. Unique patent-pending arched bridge design eliminates the chance for additional damage. Other systems without our arched bridge design are known to actually add dents to a car! Patent-pending adhesive system design guarantees dent removal without the messy, sticky residue other systems are known to leave behind. Repairs dent in almost any place on any vehicle. 3 different size size dental removal stems to accommodate many different size dents. A professional glue gun with enough glue sticks for dozens of applications.